B&Q will officially launch its first new-concept store at Cribbs Causeway in Bristol on June 16. The store is the first of its kind in the UK and has been improved to refelct the changes in the way consumers live, shop and use their homes. The end-to-end customer shopping experience has been designed to make the store more accessible. 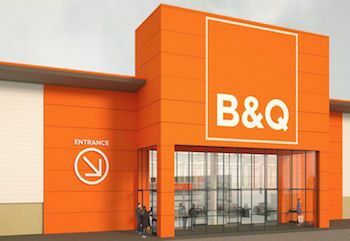 The opening will mark the first of four B&Q big box stores trialling the new concept, which incorporates the best elements of DIY from across the Kingfisher group as a result of close cooperation between B&Q and Castorama. It has taken six months to complete, and is the only store to trial in the UK. The other three will open later this year in France, Poland and Russia. Said B&Q CEO Michael Loeve: " This newly upgraded store will shape the future of home improvement shopping. The project has been a huge undertaking for B&Q and we're delighted to see it come to fruition. We look forward to welcoming home improvers from Bristol and further afield to our Cribbs Causeway store following its grand reopening on 16th June 2016." B&Q Cribbs Causeway store manager Matt Cook added: "B&Q has never attempted a project on this scale before and the impact is evident: we have created an environment where customers can come to feel inspired. It's taken us six months to complete this project, and we've kept the store open throughout this time. We've already had amazing feedback from customers who have seen the work done to date, and I'm incredibly proud of what our team has achieved at Cribbs Causeway." The opening will include a day of celebration with cookery demonstrations, creativity workshops, food, music, prizes and more. There will also be a visit from ex-England and Bristol Rovers footballer Gary Mabbutt on Sunday, June 19. After 20 years with them up until last year they had been a good employer.when you work part time around childcare (my wife became very ill) none of the builders merchants want to know. So I'm stuck. Bob vote with your feet and come over to the professional builders merchants and distribution space. What do you expect from the Sheds in reality?